Today, Walt Disney's original Magic Kingdom turns 57 years old. Yes, way back in 1955, after an amazing only-one-year of construction, Disneyland opened its gates to the public. That day, forever known as "Black Sunday" in Disneyland lore, was not the smoothest of operations, but it was the start of something new, and magical, and never before done. Heck, here was a park whose central icon--Sleeping Beauty's Castle--was based on a movie that wouldn't even be released in theaters for another three and a half years! Today, with Disneyland so entrenched in Southern California history and popular lore, it's easy to forget that once upon a time, the park's success was far from guaranteed. Walt Disney leveraged a loan against his own home to help finance the park, and had it gone bust, Disney history would have been drastically altered for the worse. Fortunately, the Happiest Place on Earth was an immediate hit, with each day seemingly setting new records in crowds. And this castle, with its cozy and welcoming stature, would become the symbol of not only the park, but also the entire company. 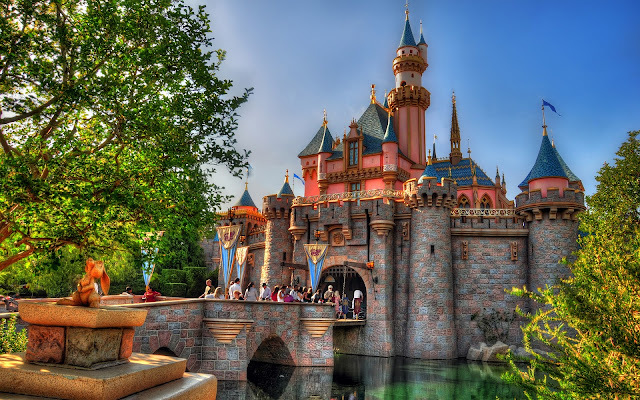 So happy 57th birthday, Disneyland. And here's to another 57 more! Sleeping Beauty's Castle on a beautiful, warm summer day.